The first item that Ms. Law wanted us to complete was finding grade 9 ecology unit activities.We began by googling general ecology activities, but this search was too broad. We decided to focus our search by using the website elearningontario, a website designed to allow teachers access to educational resources created by other teachers. Unfortunately, we required a username and password, which was easily found with a quick google search. Having gained access to the website, we began searching for grade 9 ecology activities, leading us to resources made by some catholic schools. These resources included web activities which we added to our list of usable activities. 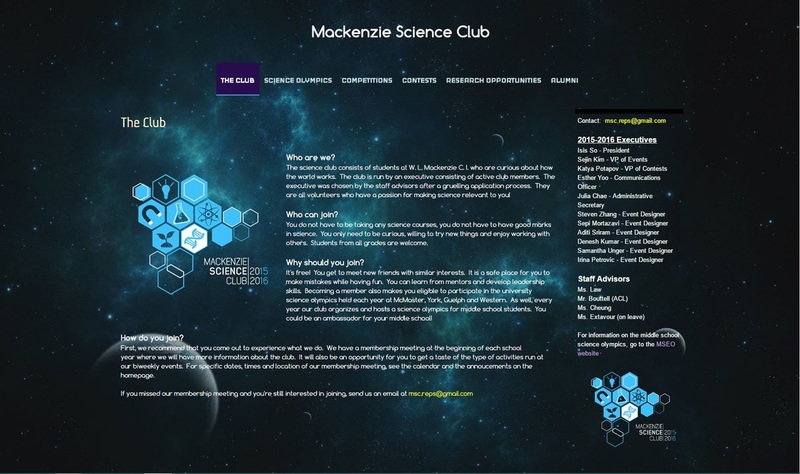 For the grade 12 biology activities we used a website for grade 12 biology homeschooling in British Columbia. We then took all the working activities and had a student who had completed grade 12 biology go through the activities to determine which activities were relevant. We removed all of the irrelevant activities. Afterwards, we sent Ms. Law a link to the document with links to all of the activities on it for her to look through.She had some problems accessing the resources from elearning toronto, so we had to download the activities into a zip folder and email them to her. We also learned how to embed the activities into google sites if Ms. Law wanted to add these activities to her website, but this situation never came up. A list of the activities can be found here. The second item we needed to complete was beautifying the MSEO and MSC websites. Ms. Law had shared the MSC Site via Google sites and we modified background, fonts, and updated all links and information about contests. We went through all the pages to ensure all information was up to date and navigation was smooth since we deleted some unnecessary content. The site can be accessed here. The third item that Ms. Law requested was the digitization of her worksheets. We struggled to find a method which we could digitize and transform documents into a changeable file format. After experimenting with a couple apps that claim to change an image into a document we realized none were able to do the job as we desired. Finally, we decided to simply scan all the documents, but the process was tedious and time consuming, which is why we were only able to complete 5 of the 10 binders. The files were organized by topic area and can be accessed here. The last item completed was the series of grade 12 learning goal sheets, meant to highlight important topics of each unit. Ms. Law had previously had a learning goal sheet for the first unit, so we made a template based on that and completed the rest of the units by reviewing the powerpoints on her class website. Thankfully one of our group members has completed the grade 12 biology course and was able to take the lead on the task. The notes can be viewed here. A summary of our completed tasks can be found below. Google Sites is a common tool used by teachers to create class and club websites, where students can access important updates and documents anywhere. There are a variety of templates and options for the layout and accessibility of the website. It is also possible to upload powerpoint lessons, link to important videos, put up review exercises, and create a class calendar so all students know the schedule of evaluations. All features on Google Sites are free, easy to use, and beneficial for students. Google Drive is another common tool used by both students and teachers to collaborate and share documents. As mentioned, all of our documents were shared with Ms. Law after completion, which demonstrates the uses and practicality of the tool. Google Drive is free to use and supports regular documents, powerpoints, Excel sheets, and allows for interaction and creativity through the Google Forms and Google Drawings features, respectively.